To prepare salsa, combine first 9 ingredients; toss gently. Let stand 30 minutes before serving. To prepare fish, combine 4 teaspoons juice, oil, paprika, and 1 garlic clove in a large, shallow glass baking dish, stirring with a whisk. Add fish to juice mixture; turn to coat. Cover and let stand 15 minutes. Remove fish from marinade; discard marinade. Sprinkle fish evenly with 3/8 teaspoon salt and black pepper. Place fish on a grill rack brushed with olive oil; grill 3 minutes on each side or until desired degree of doneness. 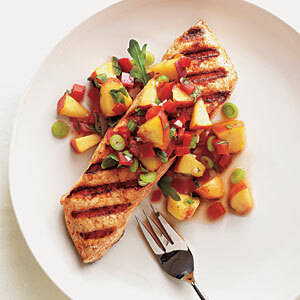 Serve fish with salsa.